In 2008, after years of living in different parts of Los Angeles, I moved downtown. I work as an attorney for the public defender in the downtown courthouse and had long fantasized about walking to work. Commuting had gotten hellish, even from nearby Pasadena. When I found a rental apartment in a 1912 former office building on Broadway, I took the plunge. The building had marble floors and walls, golden elevator doors, and grand staircases. The apartment was beautiful, as was the neighborhood. From my window I could see dozens of historic old buildings, some filthy and empty and tagged with graffiti, yet still stately. Despite the great view and the proximity to work–nine blocks–I was still apprehensive about the move I’d made. Back in 1995, when I first started working in downtown L.A., the idea of living there never entered my mind. Downtown was dirty and dangerous, dead during evenings and weekends, and devoid of housing options. This started to change in the years that followed, as buildings got renovated and restaurants and retail and services moved in, but I still wondered if I’d feel comfortable and safe there. I’m feeling a similar sense of apprehension now, as I look down from the criminal courthouse at what until recently was a massive parking lot for our building. Today, it is Grand Park, four blocks and 12 acres of green lawn and park benches, trees and plants–Los Angeles County’s multi-million-dollar bet on downtown L.A. It’s a gamble that could result in an enormous payoff for not just the neighborhood but for the entire city. If that’s the case, then the success of Grand Park depends on how we act upon it. This is a moment of truth. Has downtown come far enough along to make a public space this big and this open a vibrant place–to keep it alive not just on weekdays when the area is buzzing with office workers but on nights and weekends as well? We’ve seen premature optimism in the past. Pershing Square, another downtown park, once “grand,” was renovated and reopened amid high hopes two decades ago. Today it is a vision of concrete and garishly painted structures, with an interior almost hidden from the street. Inside, shady-looking characters lounge about, taking over benches, deterring passers-by from staying. Recent efforts to hold events there and bring people back have yielded minimal benefit. It still seems neglected and unsafe. It’s easy to imagine the same fate for Grand Park. Its motto is “The park for everyone,” but in downtown L.A. “everyone” isn’t just government employees or young new residents. It’s also drug users and homeless people. The park could easily become a nighttime home for many of them. Drinking and drug activity could make the park a dangerous place. Protesters could move in and make the park a place of confrontation. Unruly overnight visitors might leave the grass littered with trash and waste each morning. It’s difficult for security to monitor 12 acres all the time. And yet, despite these worries, I’m optimistic. Whatever the drawbacks of downtown may be, the changes for the better have been fast, even incredible. I love living there. Despite crime and homelessness, art galleries and boutiques have mushroomed. On the streets around my apartment, a multitude of new bars and restaurants have opened, one after another, several with sidewalk tables for people to eat and drink outside in the Los Angeles weather. Residents are out walking their dogs, day and night. The area is newly vibrant with people and activity, as more and more places open and more people move in. It’s a pattern I’ve seen across the neighborhood. People who come to work downtown now linger afterward, and the city is alive at night as it hasn’t been in years. Also, design matters. Unlike Pershing Square, Grand Park has a pedestrian-friendly wide-open layout. Standing at the edge of the Music Center on Grand Avenue, I can see all the way down to City Hall on Spring Street. The park is grassy and inviting in a way that Pershing Square never will be (unless, that is, Pershing’s existing structures were demolished). Done right, public space downtown has worked. Angels Knoll, a small but abundantly green park on the hillside adjacent to Angels Flight in Bunker Hill, is reliably full of office workers, young couples, and elderly people on afternoon strolls, but also with homeless people. I pass by Angels Knoll nearly every day. It appears safe and welcoming, and I’ve never seen any problems. It’s closed at night, and a lone security officer is stationed there during the day. All eyes will be on Grand Park–and not just because of its open design. Those who work nearby want to use it and want it to be safe. Developers want the park to be an improvement to the neighborhood. Investors–the city, the county, private interests–want returns. City Hall wants to have something at its doorstep that it can be proud of. So does the Music Center, which has events planned for the space and will be responsible for maintenance and operation, including security. While it’s true that if Grand Park “fails” it will fail big, I’d argue instead that Grand Park is too big to fail. So I’m excited. I’m excited for the interactive dance party that’s planned for the opening festivities. I’m excited for the slate of community events promised by the Music Center. I’m excited about picnicking at lunchtime with friends. And I’m excited to see the spaces of downtown getting filled in, giving new verdure and life to the city. If Grand Park is a success, it will breed new successes. 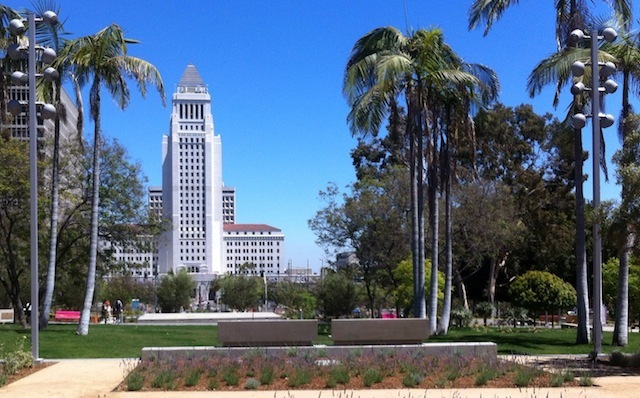 Like other world-class cities, Los Angeles will now have a downtown park that can be a destination in itself–a space that connects the civic and cultural centers of Los Angeles to one another and to the rest of the city. Los Angeles is becoming a mature city, and now, with any luck, we’ll have a city park to prove it. Barbara Marie Martin is an attorney with the Los Angeles County Public Defender. She attended college in New York and law school in San Francisco and has been proud to call Los Angeles home since 1995.